AdRoll, the most widely-used retargeting platform in the world, with over 25,000 advertisers. Get started with a $100 credit at adroll.com/twist. CarForce essentially tracks individual automotive diagnostics and instantly reports alerts to the dealership through a simple, smart device that is installed directly in the car’s system. This allows the dealerships to maintain a high level of customer satisfaction by taking the unwanted maintenance out of the equation for the car owner. Giving them the ability to keep customer loyalty high, CarForce’s system of diagnostic alerts allows the dealerships to offer services that are above and beyond the market norm. What are your goals by the end of the LAUNCH Incubator? Jessika was invited into Jason’s incubator after winning the IBM SmartCamp at the 2016 LAUNCH Festival. Graduation is July 14, and Jessika has some very specific goals for her company to achieve by that date. First, she wants to expand to three additional stores. She states, “Quite frankly, for no other reason than that’s my break even for paying my employees.” That three store expansion will get CarForce to about $20K Monthly Recurring Revenue, which will be a great starting point for launching into dealerships across the country. Her second goal is learning how to speak “investor talk.” In other words, learning the subtle cues as to whether an investor is interested or not. CEO Mike Holt explains his company by stating that “gridComm basically creates a data network over a city’s power lines, and then uses that network to control the city’s street lights.” gridComm essentially turns old-fashioned street lights into smart street lamps. The reason that smart street lamps are necessary is that, as of right now, you cannot control optimal dimming levels to conserve energy. With streetlights taking up about 40% of any given city’s electrical usage, the gridComm network shows huge potential for minimizing municipal energy costs. Founder Yoly Avalos shares the difficulty of starting a digital based company in a non-digital based country and explains the system, which is based on four simple steps that make it easy for the artist to let their music be heard, while simultaneously creating a more transparent atmosphere in the music industry. Bquate has created an easy-to-use dashboard for the individual artist to track exactly how much money they are making from each distribution channel (i.e. Spotify, Youtube, iTunes, etc. ), as well as see the geographic data on where exactly they are receiving the most downloads or streams. 0:30-4:32: Jason gives an introduction to the winner of the 2015 IBM SmartCamp, CarForce, and asks CEO Jessika Lora how she got involved. 4:32-6:11: Jason and Jessika reminisce on the way they met at the LAUNCH Festival and how she got involved in Jason’s incubator. 6:11-13:08: Jason wants to talk about the business itself, so Jessika obliges with a brief synopsis. 15:33-18:12: Jason wants to know how the company makes money. 18:12-21:22: Jessika explains why she chose to focus her customer base on dealerships rather than consumers. 21:22-25:15: Jessika details the different tiers of profitability within her company and the benefits of positive customer relationships for the dealerships. 25:15-: Jessika demos her product’s dashboard. 27:24-31:05: Jason brings up the issue of privacy and inquires about what sets of data the dealer will have access to. 31:12-34:18: Since she has been invited to the LAUNCH Incubator, Jason asks Jessika what her goals are by graduation. 34:18-38:48: The two discuss CarForce’s fundraising, so far, and the importance of vision in your fundraising tactics. Jessika then explains her second and third goals in Jason’s incubator. 43:32-45:06: Jason introduces Mike Holt, founder & CEO of Gridcomm, and asks him to give a brief rundown of the company. 45:06-48:54: Mike talks a bit about how they partner with street light manufacturers, and then explains the goal for creating smart street lamps. 48:54-52:25: Jason asks how the device itself works, and what it looks like. 52:25-: Mike shares some insights on their current project in Jakarta, Indonesia, as well as the implementations in a number of other cities. 56:23-1:00:36: The two discuss the decision to go public in the Australian stock exchange. 1:00:39-1:02:54: Jason introduces Yoly Avalos of Bquate, another finalist from the IBM SmartCamp. 1:02:54-: Yoly demos Bquate’s dashboard, and shows the simple steps involved in distributing, tracking, and monetizing music. 1:05:57-1:08:47: Jason brings up an interesting point… how easy will it be to make a profit when it is already so difficult for artists to make a living on their music? 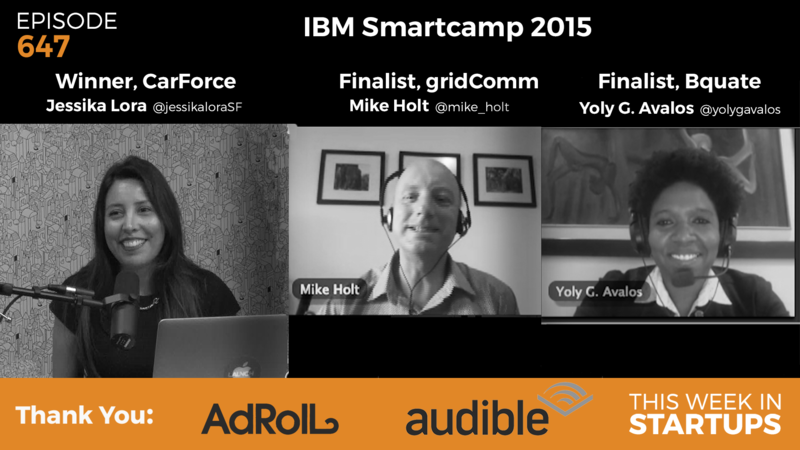 1:08:47-1:12:36: Yoly shares her journey through the IBM SmartCamp in Latin America to the LAUNCH Festival in San Francisco.